I can't even fathom that it's September y'all. WHERE the heck did August go??? I am going to be completely honest...August was supposed to be a month of rest, prep, and productivity for me. I had the month off from weddings, and so naturally, I thought I wouldn't be as controlled by my schedule. Boy was I wrong. Yes, it was productive in a lot of ways, but the words "rest" and "prep" were non-existant. August was busy...very busy, and then all of the sudden, September shoved her face in my world and made me realize HOW MUCH THERE IS TO GET DONE and how much closer this year is coming to an end. The good news is I made a lot of progress on editing, found some short cuts (THANK YOU BABY JESUS) and was introduced to a few programs that I am learning at the moment in hopes of being quicker with my turn-around. Time management is always a constant battle when you are self-employed, but I'm making leaps and bounds and so far, I'm super proud of myself. I have a long way to go still, but progress is being made. August was a month of learning, noting the changes that still need to be implemented and I started a new work-flow system that so far is working for me. HOLLA! August, you were good to me despite all the changes that came my way. August 31st marked the "ONE YEAR" mark of me leaving my full-time position at a marketing company here in Austin. I remember being scared and knowing that I was making the changes I needed to get to where I am today. As I sit here and reflect on this time last year, can't even believe it. What a difference a year makes. I got through it, and boy was it hard. BUT I am happy...so happy to be doing what I love and FULL-TIME at that. Never in a million years did I think I'd be self employed, and guess what? I wouldn't change it for the world. August also was the one year mark for my baby nephew coming into my life who is the coolest little muffin in the world. He's changed my life in a lot of ways. Being an aunt it just awesome. It also marks the one year mark of one of the hardest times I've ever faced in my life. I have never been able to go into detail on this blog for the sake of my Mom's privacy, but I can report that things are so much better for her. It's amazing at how much can change in a year y'all...I'm in amazement at the work God has done and will continue to thank him each and every day for every lessons that I've been taught. All of that said, August also was a month of BIG...BIG BIG life changing news for the Nelsons. I am still trying to decide how much I am going to talk about it, and how much of it I want to share because it's very personal for us. No, we aren't having babies yet, and yes, we are both perfectly healthy and in love as always. Things are FINE. However, we are just about to encounter a big schedule/life change, and I will have to adjust to being alone a lot more. Drew accepted a new full-time position that came out of nowhere and at the right time. We are still working out the details, praying our hearts off, and once I have more details, I will explain a little more. In the meantime, if you could just pray for us, this huge decision we just made, and the big change our lives are about to take...I would be forever thankful. 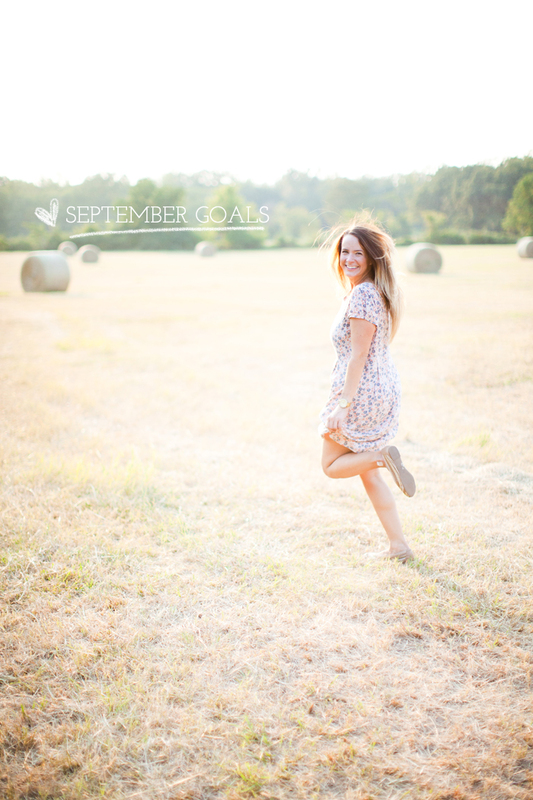 ALRIGHT SEPTEMBER- Let's do this thaannnnng girlfriend. Oooh, intern? Does said intern have to be located in Austin? Cause I love the sound of that! And that dress looks amazing on you! Love the little hints of blue (or that may be purple, I'm going color blind!)! Wow girl, you have a lot going on! Congrats on the changes, and good luck. I know how hard those big life decisions can be, especially w/careers. What marketing firm did you work for? Does the intern have to be located near you, or could the position be virtual? I know I would love working with you and would learn a ton!!! praying for you and can't wait to find out the big news! and congrats on the new car!! i cannot believe it's september. it's making me realize how much i need to get done and now i'm freaking out! Aww! Shay I just want to scoop you up & put you in my pocket! How exciting about a new car & and awesome good deal! That makes it more bearable. Congrats to Drew on the new job!! That is very exciting but, I can imagine that it's a little hard with the idea of you being alone more - that's never fun no matter the circumstances. Love all of your goals! Can't wait to see how the house looks & hear all about Miss Hattie! Speaking of... maybe making "Hattie friends" should be on your list!? LOL! Kidding!!! & Maybe just maaaaybe if you have time while you're in FW we can meet!? :))) <--- That's my BIG cheese smile! 1. Let me know if you need help planning your launch party! Would love to help you. 2. Yoga class - let's go next weekend! I have a ton of classes that I need to use and can probably transfer a few to your name. 3. GET IT GIRL. You got a lot of stuff done this month! Another great list. Here's to getting shizz done my friend! love love love you and your posts. i'm so inspired by you and your zest for life!